Amazon’s Customer Communities team has rolled out broader support for tag-based RSS feeds, according to a post from Amazon’s Ian McAllister. The new functionality has been soft-launched and isn’t currently available on all Amazon pages. Support will become available across the board in the coming weeks. The option allows subscription to feeds specific to the user’s interests and subsequently would also allow for the creation of widgets and mashups using the data created. 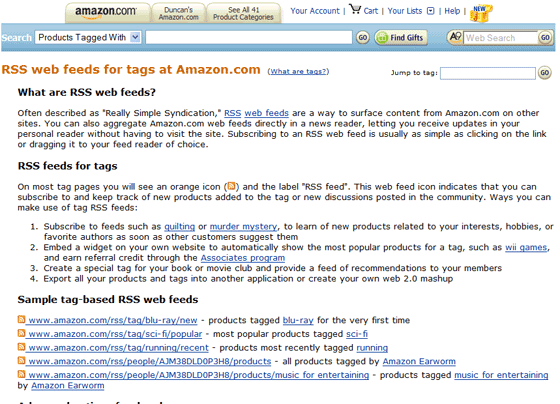 For those using the Amazon Associates Program, tag based feeds also support Affiliate Links. Examples on the new feeds can be found here.